Down a grand staircase, or by elevator, from the oversized two car garage, through lush gardens, this property defies adjectives. 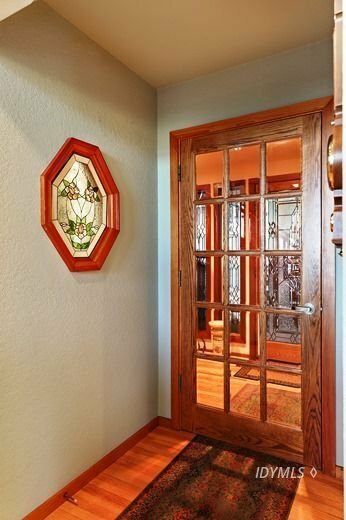 Beveled, leaded and stained, there is a gallery of windows and artistry throughout this breathtaking home. Captivating entry into the Great Room reveals floor to ceiling stone hearth, natural Pine covered cathedral ceiling and panoramic views., Formal Dining off cook's Kitchen with Breakfast Nook. Four Bedrooms in all with 3 1/2 Baths. Master Suite on main floor includes enchanting Jacuzzi Room. Lower level boasts Media/Game Wing and Office with private entry. Situated on nearly 3/4 of an acre there are fenced fruit trees and an organic Garden. Only steps to U.S. Forest and hiking trails. TV-Satellite: Dish, Propane: Available, Power: Utility Co.